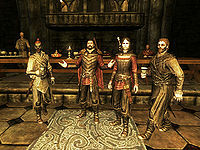 The Volkihar vampire clan is a group of vampires led by Lord Harkon, introduced in the Dawnguard add-on. They are renowned as the most powerful court of vampires in Skyrim. Residing in Volkihar Keep, an ancient castle situated on a remote island off the coast of Haafingar, the court is among the most ancient and pure-blooded of vampires in Skyrim. In the Dawnguard add-on, you can choose to join the clan to fight against the tyranny of the sun, or choose to join the Dawnguard in an effort to destroy them. Joining the Volkihar vampires requires you to first complete the quest Awakening. After completing the quest, Bloodline will begin. After escorting Serana to Volkihar Keep, Lord Harkon will offer you membership within the clan and the ability to become a Vampire Lord. This is your only opportunity to join the ranks of the clan itself. Upon accepting Harkon's gift, the quest The Bloodstone Chalice will begin. Free access into Volkihar Keep, which holds several wardrobes and bookcases that are safe containers for storage. Also included are CuSith and Garmr, two additional death hound followers. Several thralls are also available for safer feeding. The ability to transform into a Vampire Lord upon immediate membership. The Bloodstone Chalice, which can augment your vampiric powers. Access to Fura Bloodmouth, a master trainer for Two-handed, and Ronthil, an expert trainer for Speech. Access to several additional merchants: Feran Sadri, Hestla, and Ronthil. The primary Volkihar questline consists of ten quests. Two achievements (60 points; 1 Bronze, 1 Silver) are unlocked by the Volkihar questline. 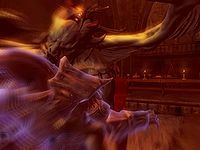 After joining the Volkihar vampires, if you decide to become mortal again by talking to Falion, upon returning to Castle Volkihar, you will be told that your mortality should be "fixed" and that you should speak to Lord Harkon (or Serana if you have completed the Dawnguard quest line), who will reprimand you for losing his gift and then bite you again, turning you back into a vampire. However, if you contract vampirism from a regular vampire (not Serana or Harkon) they will treat you the same as if you were a Vampire Lord. Attacking a member of the clan will make all clan members (except Serana) turn hostile to you. Sheath your weapon or unequip your magic and they will forgive you this time. If you attack them again, they won't calm down easily. Attacking or even killing CuSith or Garmr won't make other clan members turn hostile to you. Only the death hound you are attacking will fight back. For more information on the Volkihar vampire clan in the Elder Scrolls universe, see the lore article. Valerica's Journal de Valerica — Valerica's notes on attuning the portal vessel to the Soul Cairn. Esta página foi modificada pela última vez à(s) 07h52min de 30 de julho de 2015.